Update: The Publican changed its name to The Burgundian in March 2012, in order to avoid a legal dispute with a Chicago bar with the same name. It's remarkable what a difference can result from a bit of a reputation and the right product for the neighborhood. I don't know how well they'll do over the long run, but on their first night open to the general public, the Publican was absolutely slammed. The emphasis here is on beer, ala the owners' other locations, Bottleworks and Brouwer's Cafe. 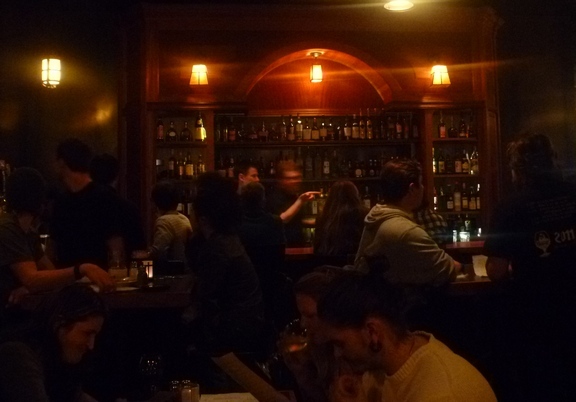 But unlike the huge choice of Belgians at Brouwers, the Publican is focused on American micros (21 on tap) and includes a significant selection of tequilas and bourbons. The food is primarily breakfast type meals, with a few burgers/sandwiches. The service was friendly but clearly overwhelmed on this night, as people filled the tables, crowded the bar, stood and waited for spaces. I'm eager to see how this place does in terms of a regular crowd and with a few of the opening kinks worked out. Historical notes: Most notably, this location hosted the Luau Polynesian Lounge from 1997 to 2010. Between then and now, it was briefly the Pour House and then Bandolero.